Novice crafters master the art of hooky rugmaking and traditional letterpress. Plus an origami artist teaches how to make something beautiful from a single sheet of paper. Making things with your hands. That's actually quite nice, doing it with your finger! It's an urge as old as time. Making something from start to finish is extremely satisfying. I'm really, really, really chuffed with that! Just got really into the zone. I'm really enjoying it! ..and make their own letter press designs. -Pull that forwards, that's lovely. We're in Bamburgh on the north-east Coast with world renowned rug maker Heather Ritchie. and I think the north-east has the most wonderful coastline. also known as Holy Island. I adore being on Lindisfarne. and the church and the castle and the seals are singing at night. fabrics and a technique known as hooking to create intricate designs. "I can get away with this!" and you don't really see them. up and "I thought, oh, my goodness, there, I've captured them. It's them. I've got them." how to create their own hooky seat cushions over two days. Welcome, everybody. Has anybody done rug making before? -No? You're all new to this? I love to start somebody off. I know more than you, you see. So, I've got the upper hand. and a sheet of hessian tightly stretched into a frame. You sit your hessian in the frame, with the one with the screw on the top. -That's right, there and that will tighten. That's it and that'll tighten up. You OK? That's right and that one'll sit on the top and tighten it. Now you can use any colours you want. and all different types of fabric. but it gives you the experience as to what's best. -You've got some greens here. Hooky rugs are made from the thin strips cut from recycled fabrics. even raw wool can be cut into strips and used to add texture. have to spin it, to use it. You can just pull it out and you can hook that in. -Do we have a shepherd here? and they've brought some wool along to use in their work. Well you're flattering me by calling me a shepherd. I'm a farmer who keeps sheep. Yes, well that's, that's the same to me. That is quite a complementary thing you know. they must first master the basic skill of hooking. So, you've all got a little hook. There's your hook and you see it's got a little hook on the end. I'm going to put the hook in and I'm scooping it. I just leave a couple of threads, I go right in and I pull a loop up. and use one hand to hold the material underneath the hessian. and pull it up through the hole. Push your hook back in, scoop up the material underneath, and pull a hoop up. and pull your hoops up to the same height. In, grab it and pull it up. -it catches when I'm coming back up. I'm pushing the hook in. But how'd you know where the wool is? Are you holding it? Yes. Yes, I've got it on my finger. Right, I'm just grabbing it and scooping it. because that actually opens up the hessian. Yeah, and just ease it through between the threads. She talks about scooping. My scooping technique's not going very well yet. I'm pulling the wrong ones through. There's just some spaces and I dunno. Because I think it'll be easier to come from the right. -I am right handed, yes. So take it from here, right and bring that end up. -Now, bring them closer together and bring them higher up. -Bring them higher up. OK? -It looks so easy when you do it. -Well, I've done it for years. she moved to Northumberland ten years ago, to set up her own practice. So, how far do you go apart just here? Just a couple of threads. Your hook has to be facing up. and if it's smooth, you know you're all right. If it's lumpy, just take it back and re-do it. -What's it like on the other side? and this, this is quite stiff fabric. That's what I've just found, is this one's pretty stiff as well. so the fabrics make a massive difference. Tracey and Adam have been keen crafters for years. this is never one that I would have considered. When Tracey said, "Oh, this is the one I really want to do,"
I was like, "Really?" "Rag rug making?'" Now I'm glad we are doing it, cos it is good. They're all filling a 20cm square. and started to blend colours and textures together. This is a bit different to the normal stitches I'm doing for work. -Oh, gosh, this is a little bit different, isn't it? My patient's not moving too much. It's quite good. There's some wool there, look. Let's have a look. Oh, that looks rather good. I like it. I think doing this, um, would give me, really some me time. How've you found your hooking? Yeah, I've got there in the end. -I've worked out how to do it, eventually. The fleece was fun to use but it's quite stiff, isn't it? -Yes, jolly good. I love it. -Thank you. I really like this, like fluffy wool. I like the texture cos it goes like thick and thin. Look what we've got for John. Wow. -..with using the, the fleece. -You see how they're different. Everybody's are different, you know. -You've all got the hang of it now, haven't you? and a little bit of practise. Right, we're now going to work on our main designs for the workshop, and you're going to make a seat pad. Have you all got a design, or an idea in your heads? like on the beach, here at Bamburgh. She was looking out at the, all the cairns that people built there. because I'm not great at drawing. so any mistakes can be easily rubbed off. I want to do something really quite bold and abstract. reminds me of being up here in the, in the north-east, Northumberland. so it's kind of a bit of a special place. It certainly is. It's lovely, love it up here. the outline is re-drawn with permanent marker pen. -So, where you want to start is, just get the outline in. -Uh-huh and then get his eye in. Always get the eye in. And then, you can just fill in with whatever you've got. My picture is inspired by my wedding bouquet. so I wanted to make something to remember my flowers by. and so I want a fairly linear picture, with some rocks here. They could do the edge of the waves, yes. -Might be quite sort of fluffy. I just love going and visiting the island. for their overseas holidays every year from October to December. They'll be going next week. I've got some cut outs. I did some drawings of things that meant things to me on the farm. trace that on and then see where I'm going to start actually stitching. He doesn't often engage for so many hours on a sort of creative project. but this is a new experience, which he seems to be really enjoying. so pff, maybe he'll have to go and hunt somewhere else, I think. A bit better close up. home in Holland for inspiration. ..it really caught my eye. -..and he loves looking for feathers. Yes! Do that then. That's brilliant. sit on feathers, maybe than to sit on a house, anyway. I do have a bit of a competitive streak. -Ah, is there competition going on here? It's the joy of making something that counts. Making things with your hands is more popular than ever before. I have a paper garden. I made it doing paper cutting. with a garden that I can just plant things. I have flowers, so I love it so much. and this is a thing for myself. that you've made, that's you, a bit of you. Just do things for fun. Make something quirky, make it crooked, make it have holes in it. I make Kirigami, which is paper architecture. So, the piece I have with me here is a scene of London. industrial buildings across East London. I feel like a kid again when I'm making Kirigami. where our next workshop will take place. I really value to come to this absolutely gorgeous Victorian space. and it's the place that I feel the happiest in. using individual letters to make inked impressions on paper. very slow process and a very articulate process. one word at a time, one line at a time, one paragraph at a time. the main form of printing and communication for over 350 years. The outcome of letterpress is usually very beautiful. those lovely things, which are very poetic but also very special. who'll be making their own personalised prints. ..and a stonemason with his son, a carpenter. So, letterpress is a really simple process, all right. It is, it is actually really simple. I'll remember that later, yeah? And one of the key kind of elements of today is, keep it simple. do, keep it simple because actually, that's what becomes more effective. Kelvin is setting the group a practise exercise. describe yourself as accurately as possible. Maybe you would describe each other. Does I have to be nice? as rude as you like. She's crazy. No, she's bright. See, you are crazy now! OK, so we're going with bright, yeah? she's got a bit of a clumsy side to her. -OK and what've you got? -Feel like I shouldn't show him now. -It's a bit soppy, your one. -Yeah. I think Knitter's all right. Can I have different type faces as long as they're the same size? That would be nice. So, you're knitting different fonts together to make a one word. -Yeah, so that's a lovely idea. -I want to go for stubborn. -I can vouch for that. And I think I might do it down here as well, just to be stubborn. -You're not perplexed, are you? But I like the perplexed word. It's great. you start to describe what lovable means by this choice of typeface? -and, you know, is it a big type, bold typeface? Cos even though he's big, he's got different side to him. to set type upside down, left to right. Everything is reverse and when it's printed, it's round the right way. -Mix your P's and Q's. Ah, is that where it comes from? -That's where it comes from. -This is where it comes from. it's time for the students to begin selecting their typeface. -I want it to look cute. -Cute isn't easy with type. you know, um... wonder where I've put them, I've moved them. dating back to the early 1900s. This is a 48-point case. -like that's got a bit of character. It's got a lovely kind of strength to it but it's also elegant as well. Just be careful with this. I'm perplexed about how to set out perplexed. so that it actually means what I'm trying to put down into words. -That's correct, yeah, upside down, left to right. E - managed to choose the letter of the alphabet out of the largest box. -That's right, that's an E.
-Lower case, L, which is in this section there. L and then back to E, there. And back to E, which is in the large box. That's great. one of the most important tools in the workshop. which is always upside down and left to right. This process is known as setting type. done using a measurement unit called a pica. along with all the other letters that follow it. Now, is the chance to look at the spaces between your letters. pieces of lead in between each letter. at the front and end of your word to hold it all together. That's right, so you got that right, lovely. You got it right, there. So, they're all upside down. -Except for the R, which flips round the other way. So that's great. If you wanted to, we could open these up slightly. It's quite a wide font. to drop a few of these in there at a time. You are determining that there's a space in between each one of these. That's lovely and when you're done, put the lead on top of there. So, that is your line set, upside down, left to right. Once it's printed, it's printed round the other way. the students have chosen a metallic silver ink. Really lovely and metallic ink, OK.
using a 19th century pedal powered press. The mechanism is lovely, OK.
That's it. There we go, that's it. So, it's quite a weight on the pedal, isn't there? Got a bit of a motion. ..the rollers lift up onto the inking plate. so that it just mixes different parts each time. Yeah, that's what's lovely, isn't it? And it kind of ticks over, you know? It's a bit like, um, one of those old bikes. I used to have a bike like this. -What kind of bike was that? It was like a fixed wheel, so like, to break you'd have to pedal backwards. -So, it reminded me of that. What you're doing is you want to make sure the plate is solid with ink. nice and square and just, that's it, take your hands out. And that takes the press, pull that lever back now, please. -Leaving the backing there, if you can, and then have a look at that. So, look at that. So, look at that, so, a bright bright for Bianca. -Yeah, but it's still got a quirky feel to it. it has the effect I wanted. So, I'm happy with that. So, if it was round the correct way, it wouldn't mean anything. going on there is the thing that makes it interesting, typographically. It's really lovely. I really like it. Really simple. I think something about that is really classy. or as complicated as you like. Even a single sheet of paper can be made into something quite beautiful. and he hasn't stopped folding since. which can also be made into LED fairy lights. You need a square piece of paper. I've got a nice pink one. So, um, we're going to start with the white side. Everyone needs a creative outlet. Everyone needs to be able to choose something they can touch and feel. It's a response to our digital lifestyles. Just poke it in the middle, all the way down and it'll kind of pop. without any distractions from work or life or money troubles. bit like a bird mouth, looking for a worm. a crumpled piece of paper and you can start folding. just visit our website, where you can follow instructions. It's slow, isn't it? It looks amazing. -It's such a lovely yellow. -Yeah, it's really hard work though. under the watchful eye of rug expert, Heather. -I'm climbing the tree trunk there. and it all pulled out. What do you say then? ..I felt like saying something. The students are working on their foregrounds. First, hooking the outlines before filling in the shapes. Have you done this all your life then, pretty much? No, I moved into the Yorkshire Dales in 1971, um and everybody made rugs. I would be making mats and I really got quite addicted to it. I discovered I could do a scene on a rug and everybody loved it. So, oh, do you recognise it? Oh, good! Good on you. That's great cos it's just my impression of Bamburgh Castle. It's not finished yet. I'm working on it. and just hand cut fabrics have gone into that. dad was blind and when Dad lost his sight, he wouldn't have a guide dog. -He said he had a little girl. And she would be his sight, his eyes and that's what I was. And everywhere we went, we counted the steps. the steps across the street, so he knew where the kerbs were. So, that's my little memory rug of Dad and walking round Sunderland. ..the light on the building. Well, it's just a bit of artistic licence, have a bit of fun. Got my blues, my yellows and my reds. Cos I want to try and keep a limited colour. That's gorgeous. That's lovely, yes. Now, I've got this little magic tool here. mix the colours for you in there. -Oh, I wondered what that was for! -Yeah, it's my little secret gadget. So, you zoom in on there and it'll let you see the colours. -Your eye would see them from the distance. No, till you've got the arrangement you want. -It's my favourite little thing. Look at this bobbly wool. This is really good, isn't it? -I bought this in the charity shop the other day. -This is when she gave me too much change. I think it's a bit heavy to do a bit more, isn't it, really? -Oh, right, it looks good. Yeah. -Shall I do a whole row of it? so I can show, hopefully, it'll look a bit more wavy. That's the idea, like the wave tops. Is this like how it comes off the sheep? The lanolin in it, in your hands. You'll have lovely soft hands. -It does! Smells really nice. feathers on the seat cushion she's making for her son. It's getting a bit better now I've found this fluffy stuff. It makes it a bit more feathery like. So, what does your son do with his feather collection? -and he shows them to everybody. And wants to look at them. That's it, isn't it? spells of it over the time, and I do think that crafting's helped no end. the problem with anxiety is that you overthink things. fall into this kind of cycle of self-doubt and things snowball. which is nothing and it gradually, it builds into something much bigger and much worse. those thoughts, cos actually you're thinking about doing something else. it's a really, really, powerful tool to help, kind of, calm your mind. if you'd like this colour for your background? I thought it had a bit of shine that might look really nice on yours. Oh, I actually do love that. Thank you so much! Heather's confident that they can tackle a variation. I would like to introduce you to the proddy technique. You've been doing the hooky but now, you need to do the proddy. You might want to incorporate some of this into your designs. using a spring hook, which pinches the short strips through the front. So, you're gripping it like tweezers, pincers, and you leave go. want to incorporate that into some of your designs you're doing. round, so this one might make a nice fancy little border for me. Oh, I like that border idea. Yeah, so you can make a nice little frilly border. on a point to make them look more like leaves, rather than flat ends. So, I'm going to do that for some other leaves a bit later on. Right, guys, you've got 30 minutes to finish. -Ooh, come on, come on. -Can't be done! Can't be done! Yes, it can. It has to be done. I'm just going to get my head down and keep going. -Let's have a look, Tracy, hold it up for me. I'm not holding it up! I'm on a roll, I'm not stopping. -You're going to be the first to finish. no laptop here, no kids, no dentistry, so another border it is. Down to literally the last three, maybe four stitches. -She's too busy to talk. Yeah, you could hear a pin drop couldn't you now? Hear my brain whirring away. Oh, no, no it wasn't. All right, that was a, that was a false start. I've just seen, I've seen a little gap...I forgot to fill in. all sorts of different materials. Well, these are um, woollen painting. something colourful and bright and therapeutic and I found felting. It's wonderful. It's my life, you know? It's my love. This is a little quilt that was made in HMP Wandsworth. I teach prisoners to quilt. a real feeling of hope and it fosters a great sense of self worth. I can keep forever and it's beautiful and it makes me happy. that we're going to have a look at this afternoon. the students are preparing to design their main prints. You want to make a project together. -OK, do you know what it is you want to do? We want to make Save The Dates for our wedding. Where's the ring? OK, well, well done. Right...do you, have you a strong idea? OK great. What kind of poem is that? so I like that sort of quirkiness of having the patois in letterpress. and his design is based on his favourite carpentry phrase. I think it's quite relevant to me. Making runs in the family. His dad, Neil, is a professional engraver. Malcolm McLaren and Patrick Caulfield. Over the 40 years of my career, you learn a lot of things. very young and sometimes very old, if they're lucky. So, really poignant stuff, really. -And I want to somehow create that. -just to dive straight into the design thing. to working here and then, if you two work side by side over there. and I will be, heads down, coming down, thank you very much. but he used to write poetry. Lorna's Jamaican father would write letters to her, in rhyme. And so, it's given me that love for rhyming. so that's how I got into writing poetry. -Fantastic, so, I see it's from the correspondence from your father really. Lorna is from East Sussex. She's studying knitting at the Royal College of Art. -And so, that's the way it goes. -Yeah, but we like to say, a soh it goh. when people say like, as a black person, where'd you come from? And you say, I was born in England. But where do you really come from? So, it was a response to that and saying that you can't take my identity. What you have you can't take from me. No, you can't take my identity. So, it's only two lines from a longer poem. How mixed do you think the font needs to be? so I just want it bold and simple. Lorna has opted to use a tall, slim, sans serif font. -Ah, is there a reason why you putting them upside down? Is there a reason why you're putting them upside down? -and this is where you're going to enjoy yourself. So, it's left to right but it's upside down. -We have got a mirror. Cos I can't...I know what you're saying. If you do this and in here is the image. Oh, yeah, OK, yeah, yeah, I could look at that all day. That's like, it's like magic. -Do you want the proper names or do you want Ant and B? Or do you want Anthony? Or Anthony and Bianca? No, Ant and B, a bit more personal. -He stole my heart, so I stole his name? -So, I'm stealing his name. Oh, I'm sorry, so I'm stealing his name. And, um, we'll put A & B. -Save the date. Do you want the location? last year and they're getting married next summer. We met online... Online dating. So we're a new age couple. Yes, definitely. Um...I wasn't on very long. and in the two weeks she was all right, she found someone. nearly three years, here we are. Bianca has already chosen the colour scheme for their wedding. -How many times have I showed you the colour? but on a printing press you've got to think about these things. So, where it's a str... It's um, it's interesting. I don't think I've ever seen you so into something, or focused on something. Especially when it comes to the wedding. East, I need Sussex, we just need an X.
I think this is the X. -So, there's East Sussex and then we need 25th of the 8th 2019. See both of you kind of understand the structure quite quickly. -It all makes sense to you, doesn't it? See... I then T, I, then I need a T.
Yeah, I think it's going to work, yeah. That's really good. I'm happy with that. I can physically feel the word as well, so it's really helpful. That's a really nice help you know, emotional response. having a relationship with words. I'm very proud of myself that I've been able to do it. in identity, with an upturned exclamation mark. I'll just have it on identity I think. ..but in a subtle way. -Cos I am very subtle. -Yeah, no. I can see that! That's lovely. I think that's a really nice touch. It's all working out. Do you know what that is? Good design. the students to begin locking them into a frame, ready for printing. This is known as building the form. To do this, drop a metal frame, known as a chase, over your type. Now you need to consider the composition of your print. Where do you want your word on the paper? always remembering that printing works the wrong way round. These are known as furniture. by finding space for some coins. expand to hold everything together. and the leads are nice and level. Now you're ready for printing. -Doing my head in this is. God's sake! So, if you do that, it pushes this out a fraction. I don't think I've got a lot of patience. Clearly not! Then go back to this. So, you have to be patient. You can't not be patient with this. to make sure they're happy with the design and the spacing of the words. Walk along with it. Let it run through your fingers. you'll bounce off the springs. Keep going. OK, lift this up. I like this part here and here and here. It's lovely. Really nice and I like the... I do like the bits missing. I love the wood type. Yeah, the wood type's great. way away on the today, from everything else. -So, it needs a bit of refinement. ..to print their final work. -We're going to do a good print, OK? Yeah, yeah, yeah, yeah, yeah, yeah. I like that. That's brilliant. Yeah, I like, yeah. That's good. -Thank you so much. I'm so happy with that. Yeah, I'm absolutely speechless cos I'm that happy. How about that? That is a miracle. That is a miracle, I agree. -and it's been really nice building this together, hasn't it? From scratch, cos we've done all of it from scratch. freedom and allow the juices to flow a bit. I'm really, really, really, really chuffed with it. It's come out better than I could have expected. thinking, "Wow, I'm proud of you, daughter." Right, so how do you all feel? Cos I'm ecstatic! In Bamburgh, the students have finished hooking their seat cushions. I just think they're absolutely fabulous. Just hold them up, let me look at them. You can hear it barking. I'm really happy with it, actually. Yeah, loving the little dog. It's quite Art Deco, that. Ah, I'm very pleased you said that. Right, come on then, let's see yours, Indra. -Once in a blue moon. Lindesfarm Castle by the shape of it. -It's weird how different they look out of the frame, actually. raw edge over and hem the overlap, onto the back of the hessian. ready for it to go on a chair. Olly has come to see what his mum's been busy making. Mummy made something, especially for Olly! Look! I made them all for you. Do you know which bird these are from? Oh, it's a good cup of tea, is this, I'll tell ya. It's a lot better just than a wooden chair, isn't it? I've got five more now to make for the dining table! I think we should propose a toast to Heather, here. This forces you to slow down. I have absolutely no sense of time at the moment. So pleased with that, look at that. The first episode follows two groups of novice crafters as they master the art of hooky rugmaking and traditional letterpress. Meanwhile, origami artist Sam Tsang teaches how to make something beautiful from a single sheet of paper, folding an origami lily which can then be made into LED fairy lights. On the north east coast in Bamburgh village, world-renowned rugmaker Heather Ritchie welcomes six amateur crafters to her two-day workshop in the local cricket pavilion. She teaches them how to 'hook' their own personalised seat cushions, inspired by their favourite places. Heather has been hooking rugs for over 30 years. 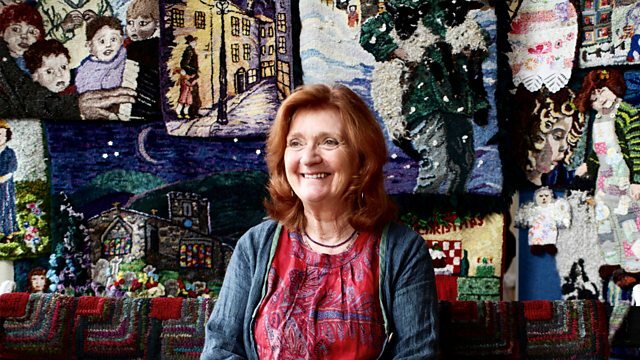 She discovered rugmaking in the early 70s after moving into a cold, flagstoned cottage in the Yorkshire Dales. The hooking technique allowed her to use recycled fabrics to produce rugs that insulated her home. After getting 'hooked' on the basic technique, her functional household rugs soon developed into intricate works of art, each one capturing a memory from her past. The workshop is attended by married couple Adam and Tracy, dentist Indra, A&E doctor Lucy and local farmers Mary and John, who bring some sheep fleece along to use in their work. Meanwhile, in south London, wordsmith and typographer Kelvyn Smith invites five students into his print studio for a one-day masterclass in letterpress printmaking. The 350-year-old printing process is new to all of Kelvyn's students, so over the course of the day they learn how to use a composing stick, how to set type and build a form, before proofing and printing their own pieces of work. The workshop is attended by engaged couple Ant and Bianca, gravestone engraver Neil and his carpenter son Otis, and textiles student Lorna. Back in Bamburgh, the hooky seat cushions are ready to go on chairs, and the students take a stroll to the beach for a celebratory slice of cake and cup of tea to try them out for size. Sheep farmer John's work really impresses teacher Heather - 'now who'd have thought a sheep farmer could make something as beautiful and artistic as that? '.